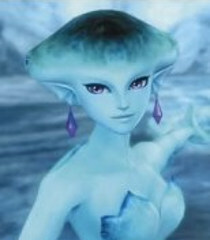 It's me, your fiance, Ruto! Princess of the Zoras! I never forgot the vows we made to each other seven years ago! You're a terrible man to have kept me waiting for these seven long years... But now is not the time to talk about love... I'm sure you've already seen it! Zora's Domain--totally frozen! Link... I would have expected no less from the man I chose to be my husband. Zora's Domain and its people will eventually return to their original state.